Shopping for Teenage Mutant Ninja Turtles Mini-Figures? Minimates on the half shell! 18 randomly selected 2-inch tall TMNT Minimates! Featuring interchangeable parts and accessories. May include Leonardo, Michelangelo, Donatello, Raphael, and more. Watch for the rare glowing Michelangelo! This display box contains 18 randomly selected 2-inch tall Teenage Mutant Ninja Turtles Minimates mini-figures with interchangeable parts and accessories. You might get Leonardo, Michelangelo, Donatello, Raphael, April O'Neil, Shredder, Foot Soldier, Footbot, and/or a rare glowing Michelangelo! 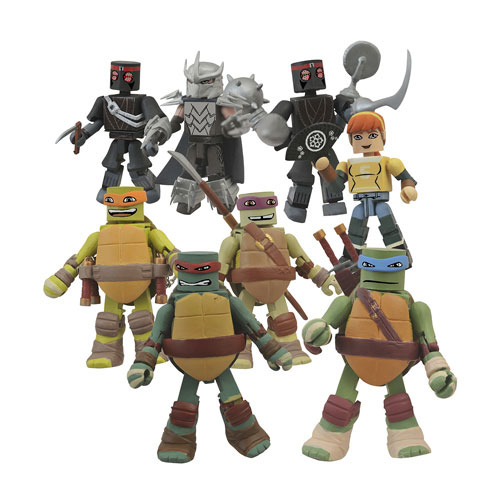 The heroes on the half-shell are joining the Minimates family, and DST is offering them in a unique way with this Teenage Mutant Ninja Turtles Minimates Display Box. Each countertop display contains 18 blind-bagged pouches, and each pouch contains one 2-inch tall Minimates mini-figure featuring interchangeable parts and accessories. Designed by Art Asylum, the assortment includes 9 different Minimates: Leonardo, Michelangelo, Donatello, Raphael, April O'Neil, Shredder, Foot Soldier, Footbot, and a rare 1-per-case glowing Michelangelo! Which ones will you get? This Teenage Mutant Ninja Turtles Minimates Display Box contains 18 individually blind-bagged pouches (subject to change).